After locking at least 200 pips on my GBP/USD trade, it’s time to find a new one! For days now I’ve been hearing about how the euro zone has been releasing weaker-than-expected reports. Aside from disappointing numbers from Germany and France, the euro zone’s industrial production numbers also came in five times less than what many analysts had expected. FIVE TIMES! And don’t let me get started on what Draghi said about the positive reports being surveys instead of hard data. EUR/USD’s chart is also currently an eye candy for a bear. As Big Pippin pointed out today, EUR/USD is having a hard time breaking above the 1.3300 handle, which is near a previous support and the 61.8% Fib on the 4-hour chart. 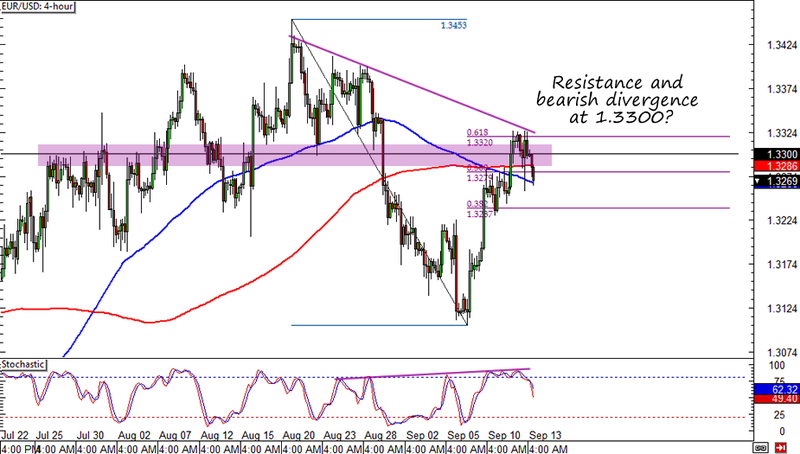 There’s also a bearish divergence, which could help propel the euro bears. I’m planning to take advantage of the euro’s weakness by risking 0.5% of my account on a short order at the 1.3300 major psychological level. I’m thinking of placing a 100-pip stop (1/2 of the weekly ATR) and place my initial target at 1.3100 near a previous low. This should give me at least a 2:1 risk ratio. I probably won’t set orders yet. I’ll be keeping a close eye on the pair, especially around the U.S. retail sales report, to see if the pair had indeed been rejected at 1.3300. I’m willing to sacrifice a few pips and enter at market if the euro continues to weaken without retesting the 1.3300 MaPs. That’s my plan for today! Am I being too conservative by waiting for 1.3300? Whatcha think?